Black and white photograph showing the building that was the Port Whitby Post Office from 1894 to 1913 when the Goldring Store took over postal duties. This building is located at 1615 Brock St. S. View is of the south side of the house. 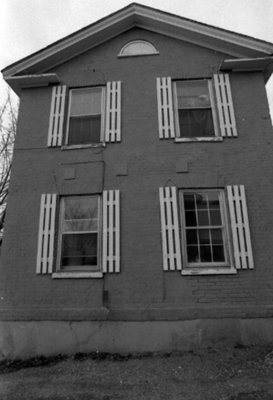 This house has since been demolished. This brick house was built about 1841 for Port Whitby brewer Abner Nash. Port Whitby Post Office, 2006, Carl Ferencz. Whitby Archives A2013_013_018A.